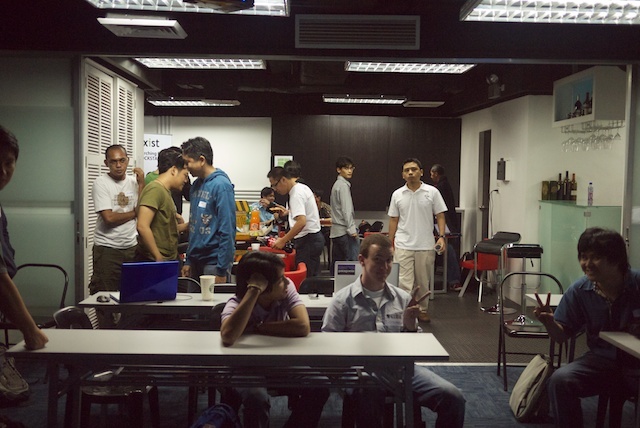 I went down to the Exist offices tonight to meet up with the guys from PhRUG (Philippine Ruby Users Group) for the October Meetup. I arrived a bit early, around 5:45, well before the 6:30 official start time. There wasn't really anyone else here other than Rad. Eventually people started showing up. I think the next group to show up was the whole Phil. IT Org crowd. Then people started slowly trickling in. I spent a bit of time in the beginning chatting with Rad and giving him a couple ideas for his talk. We ended up hacking up some more metrics for his Redis benchmark using the mysql gem and comparing it to mysql performance. 1. Rad & Topher were filling in for Cyril, doing a talk on Redis, a somewhat speedy and flexible keystore "database". They gave a quick overview of what Redis is, why it's cool and what it can be used for. They ended the presentation with a showcase of benchmarks highlighting Redis' strength and speed. 2. Rico gave a quick talk about cheap tricks you can do with user interfaces that big websites do like Gmail, stuff like in-page reloading and other fancy things that seem difficult from outside, but are quite easy once you get down to it. 3. Bry came up to talk about a project he's been working on. This project is called Rails FTW (Rails For the Windows). It's supposed to be an alternative to the Ruby installer for Windows, which is meant as a one-stop tool for people who want to learn Ruby/Rails. They can install (the software) and get going with Rails right away, no extra steps necessary. After everyone started heading out, we went over to a watering hole next door to grab a couple of beers and talk some more. Overall, it was a great event. Great job guys!